Yes, Anagen stimulators are ABSOLUTELY important! Below are multi-hair follicular units harvested via CIT. The patient who underwent the procedure noted shedding in the donor area just one month after beginning Propecia. The patient also stated that each morning when he awoke, he began seeing 12 or more hairs on his pillow. He also stated that he began seeing more hair come out when he ran his hands through the back of his scalp. He clearly stated that the shed hairs were from his donor area. Examination of the grafts revealed a 17% telogen ratio. This is high for a donor area, but not beyond the normal limits. According to Kligman, one can have up to 25% telogen hairs on the scalp. The history was very suggestive of an increased telogen ratio and this is what we found. Typically there is no more than 8% to 12% telogen hairs in a given donor area. Propecia stimulates anagen. When a new anagen cycle begins, the old resting hair is pushed out of the scalp and onto the pillow. The shift to anagen suddenly by propecia was evidenced by increased shedding. Incidentally, each hair has only so many hair cycles. This is why you want to load up on anagen stimulators designed to prolong or promote anagen. These include Propecia, Avodart, Minoxidil, Nizoral, and Hair Cycle Shampoo. Multiple products used concurrently probably work better than one product at a time. Interesting, what can we tell from the pics you posted? Is Propecia considered an anagen stimulator? It is a DHT blocker, it doesn’t really stimulate anagen growth in my opinion. » doesn’t really stimulate anagen growth in my opinion. To me it sounds like the patient experienced telogen effluvium after his CIT procedure and the clinic is blaming propecia instead of the surgery. Also the idea that a follicle only has so many cycles is pure conjecture with no scientific basis whatsoever. » » doesn’t really stimulate anagen growth in my opinion. » CIT procedure and the clinic is blaming propecia instead of the surgery. What is the reasoning for that? Can a hair transplant surgery trigger the high telogen ratio in the patient? » » » doesn’t really stimulate anagen growth in my opinion. » high telogen ratio in the patient? Oh yes!!! If the donor area is traumatised then severe shockloss / hair going telogen and falling can occur. This is a particular concern with CIT / FUE because the potential for trauma around the removed follicles covers follicles all over the large donor area. This cannot be underestimated!!! This is correct. I have experienced some degree of shock loss (TE) from all of my surgeries, strip and FUE. It does happen and is much more prevalent than is reported. As far as I know, Propecia and Avodart are NOT anagen stimulators. They may protect hairs in the anagen phase, but certainly do not promote/stimulate growth, IMO. » » high telogen ratio in the patient? » follicles all over the large donor area. This cannot be underestimated!!! I think we need to distinguish real telogen effluvium where there is a higher than normal ratio of telogen hair in the scalp as opposed to shock loss in the donor due to surrounding follicles being transected during fue. Technically, shock loss due to transection shouldn’t even be classified as telogen, the donor follicles were not triggered into telogen phase, they were simply cut dead (literally) and fell out as a result after a hair transplant. » » » high telogen ratio in the patient? » loss in the donor due to surrounding follicles being transected during fue. » » » » high telogen ratio in the patient? I suppose the big difference is that if the hair loss is because of transection, then the hair will be gone forever, whereas if it is because of telogen efflv, the follicle is still intact and will grow back once the growth cycle switches back to anagen phase? » Interesting, what can we tell from the pics you posted? You may or may not be able to see that the hairs are significantly smaller and have less pigment than the surrounding hairs within each follicular unit. Not all hairs are in the same phase at the same time. 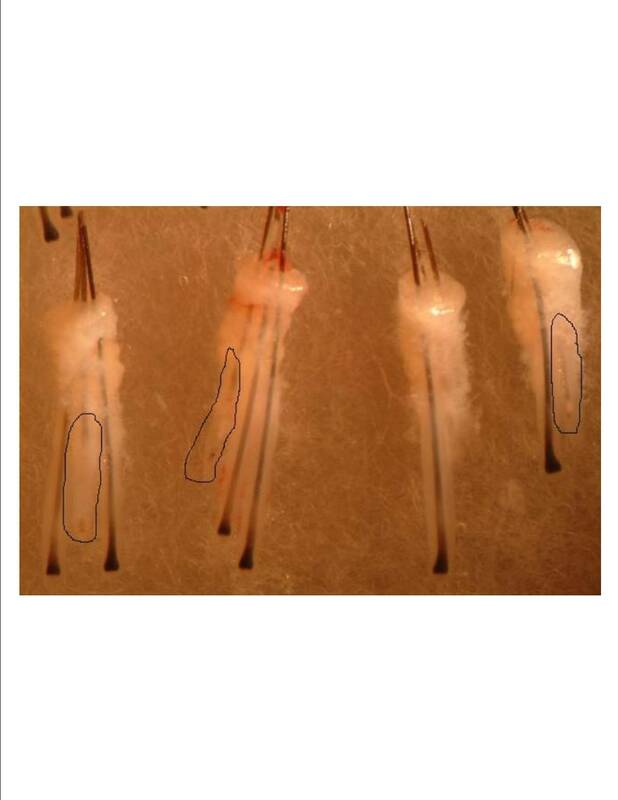 There are specific differences of how each follicle is handled after the initial harvesting via FUT, & CIT. In FUT (strip), almost always all grafts are cut by a team of surgical assistants. In CIT, grafts are extracted (cut) by the surgeon which enables the donor area to be efficiently harvested. CIT has significant data recorded and a documented transaction rate of 2%. The CIT method also allows each harvested graft to contain at least 2.9 hairs. The products prolong the anagen duration and therefore delay the inevitable, which is hair loss. All hairs are in a growth cycle which ultimately leads to exogen or temporary loss of the hair. Hairs definitely have a limited number of cycles. After hairs have come to their last cycles, they begin to miniaturize. The resting phase cannot be totally avoided, but through anagen stimulators, it can be delayed. The aforementioned products (Nizoral, Propecia, saw palmetto) seem to help with the prolongation of anagen. shampoo and conditioner. I generally recommend that individuals consider maximal medical management to help maintain their hair. It certainly is a better alternative than surgery for many individuals. Propecia prolongs anagen duration and therefore delays the inevitable, which is hair loss. All hairs are in a growth cycle which ultimately leads to exogen or temporary loss of the hair. Hairs definitely have a limited number of cycles. After hairs have come to their last cycles, they begin to miniaturize. The resting phase cannot be totally avoided, but through anagen stimulators, it can be delayed. The aforementioned products (Nizoral, Propecia, saw palmetto) seem to help with the prolongation of anagen. shampoo and conditioner. I generally recommend that individuals consider maximal medical management to help maintain their hair. It certainly is a better alternative than surgery for many individuals. interesting indeed! but as a former patient, sometimes CIT does not work so great! » » » » doesn’t really stimulate anagen growth in my opinion. The fact of the matter is that in this case telogen hairs were already in the resting phase prior to CIT harvesting. Also, most efficient hair transplant methods have a low probability of causing donor area shockloss. There shouldn’t be any greater concern about CIT causing shockloss in the donor area than any other method (strip & FUE). There is no logical reason to assume that a procedure could immediately cause harvested donor follicles to loose pigment and shrink. During ANY hair transplant procedure, trauma can occur and cause a small percentage of surrounding follicles to fallout. The shockloss is almost always temporary and the hair usually regrows at about 2 months post-op. It is nice to know that our transection rate of about 2% does account for all transection within the entire donor area. We have seen very few cases (2 out of 2,000) where donor shockloss had occurred. 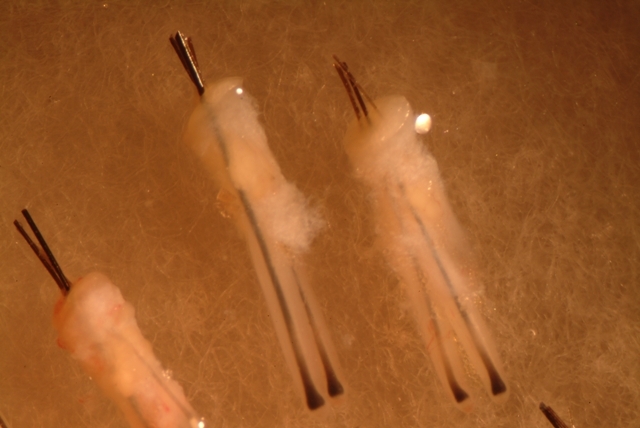 Attached is a microscope photo marked to show the telogen hairs. 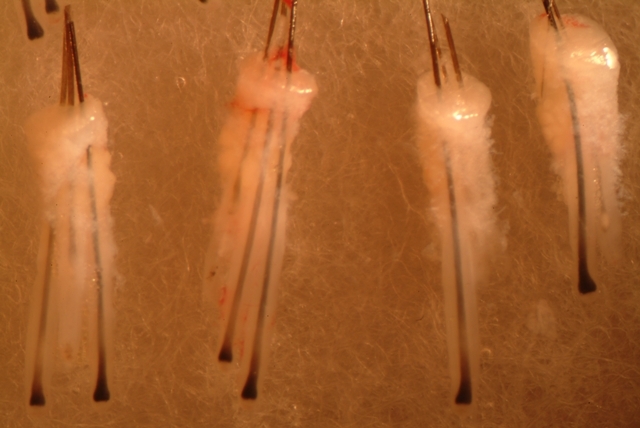 Notice that the telogen hairs are lighter in pigment and are much smaller than the active hairs. This is simply because the hairs are in the resting phase. As no surgery is scarless, no medical procedure is an exact science. The results are in the eyes of the beholder. As for the results, they vary from patient to patient. Feel free to post a few photos so that we can see the results for ourselves. » the results for ourselves. absolutely agree on this and i don’t blame the doctor who perform the surgery,as for the pictures, my pleasure,i will! here’s one for example after about 900 CIT in the trontal hairline! as for my results the doctor was agreed to see the non-results! he proposed me a new procedure but the first one was such a failure that i was bit worried for a second one but it’s just my own experience and as you say before results vary ! Not a single scientific paper or study has ever shown any such thing. It is a pure guess. » is a pure guess. You’re Right! Technically, males can see signs of miniaturization pretty much at the ripe age of 17 or even into the mid 30’s. 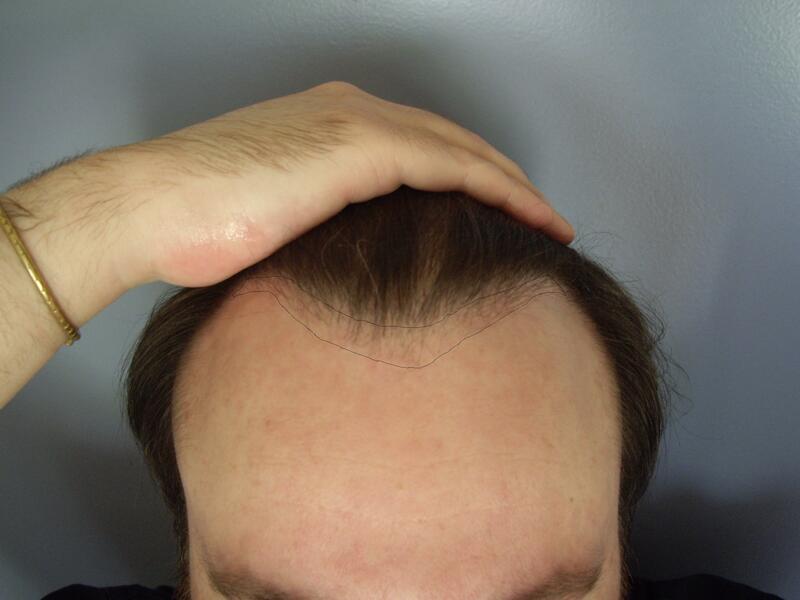 Males who will have a higher degree of hair loss will experience male pattern baldness first.